#1 Enemy ... Weeds! I can't seem to stay on top of them this year and they are driving me mad. I try to embody my neighbor who loves picking weeds and claims it therapeutic but I just can't seem to get there ... or talk her into picking my weeds! It was time for me to find a natural weed killer. There are a lot of recipes out there and a lot of them didn't work for me. I had to play a little with amount of vinegar to kill my weeds and it finally worked. I also read that by adding a little lemon essential oil, it will help the solution stick to the weed so you can really get it! When applying, make sure that you are going to have good sun for a few days. I sprayed them two days in a row and on the third day, it was easy to pick them up and discard them. Be careful though, this solution is strong and will take care of the plants and grass that you love so make sure you are just spraying your weeds. Use a test spot to make sure the solution is right for you. You may want to start with less vinegar and add more as needed. 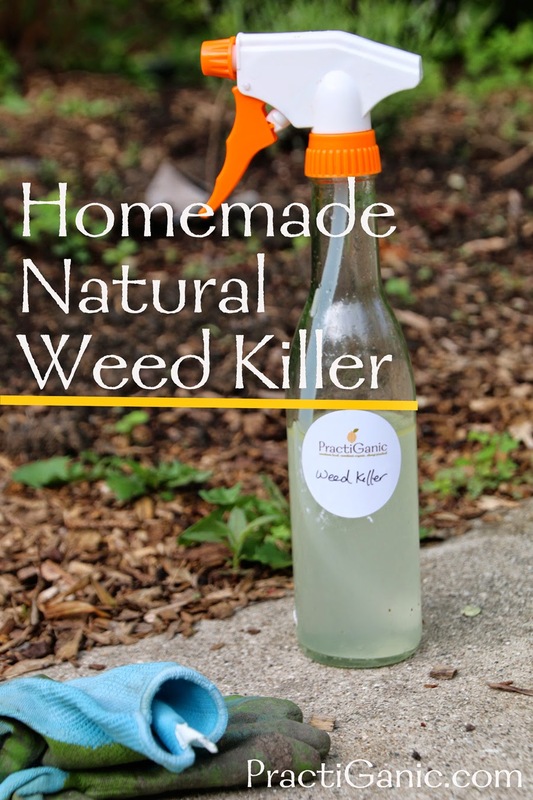 Because of effectiveness of this weed killer, I don't like using it in my garden beds, I'll still put in the effort for those but it has saved my back and my lawn! Let the solution sit for a day before using. Cover them with newspaper or cardboard, smothering them from sun and air. This usually takes a few days.